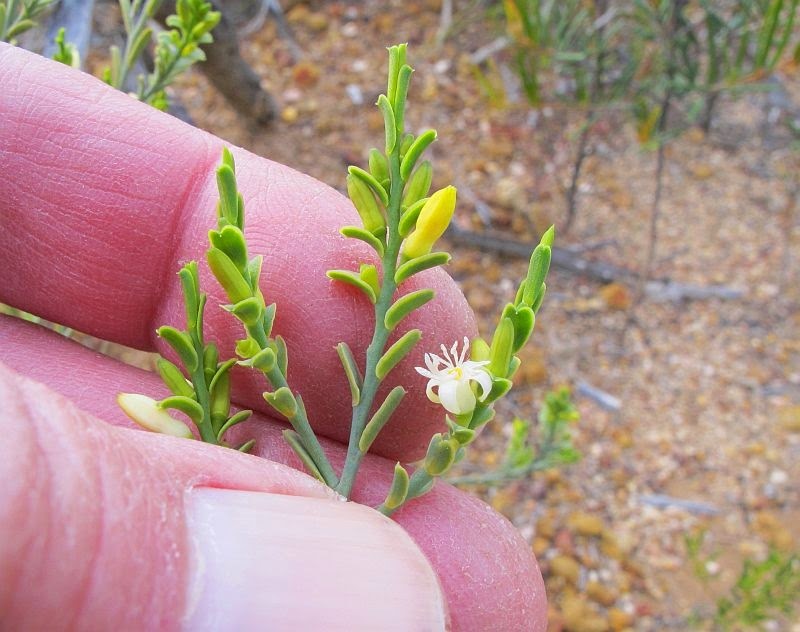 Flora observations within 160 km (100 miles) of Esperance, Western Australia. 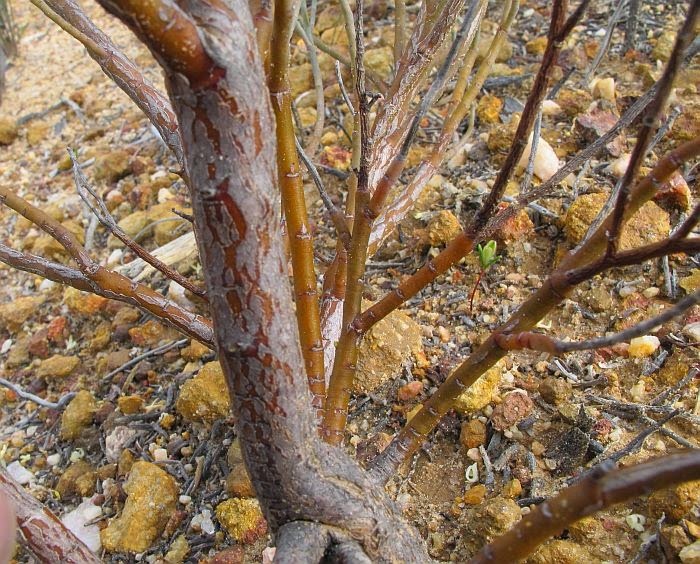 Australian plants in the Olax genus are another group of shrubs and trees that are partially parasitic on the roots of other species, although rarely causing harm to their hosts. Despite the many species of root parasites in a number of genera and several families, they characteristically have a distinctive pale colour of grey, yellow and green and once noted, it can assist in formally grouping many species even when not encountered before. Apart from an odd record on Kangaroo Island in SA, all others of this species are from the SW of WA, ranging from north of Geraldton to the edge of the Nullarbor near Israelite Bay. 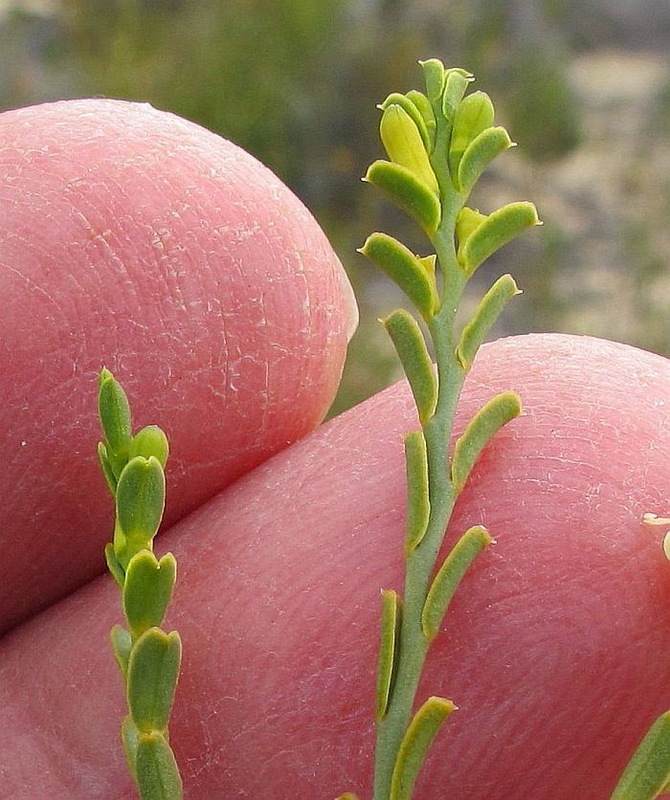 Despite the number of coastal records, in the Esperance region I mainly encounter Olax benthamiana in non-calcareous soils further inland, especially mallee heaths. 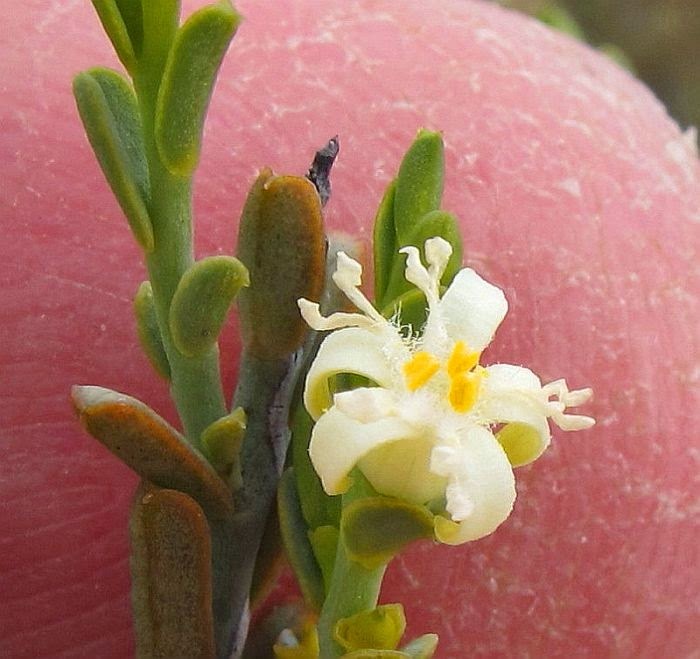 It appears quite adaptable and may be found in sand and/or gravel soils, often as individuals or in small colonies, although I have seen an extensive open colony of many hectares/acres, growing in heath on a sandy soil overlaying gravel. 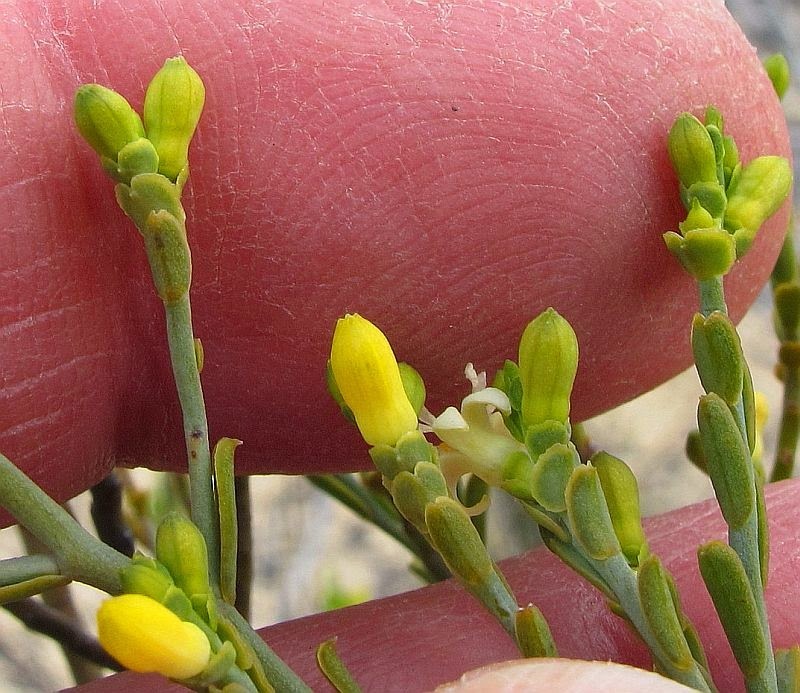 There are six Olax species in WA, (others elsewhere in Australia and overseas), but only two of these are in the Esperance district, but confusion between them are very unlikely. 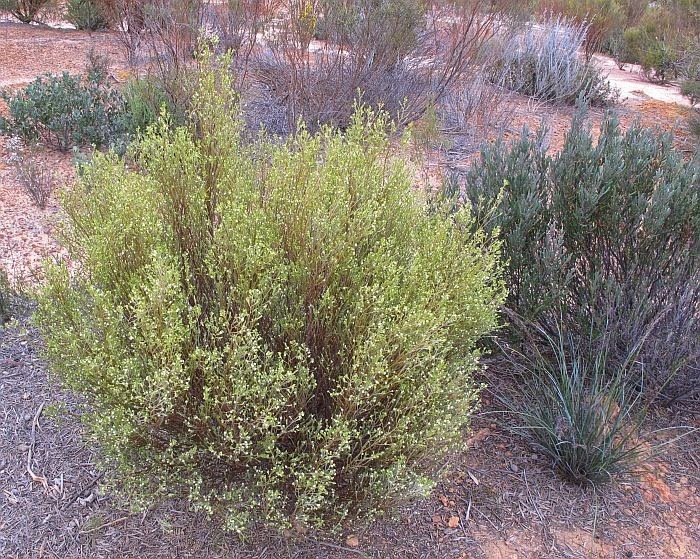 The other is a coastal species of calcareous soils, with larger, soft pendulous foliage (see here). Olax benthamiana is recorded growing to 1.7 metres (nearly 6’) in height, although locally they are seldom more than half that size. The creamy/white flowers are produced from June to December, although local weather conditions will determine the exact period. The flowers are usually 5 petalled, although occasionally 6. There are 3 fertile (orange) stamens and 5 staminodes (infertile stamens), which are divided (bifid) near the summit. Olax belongs to the Olacaceae family. There are three blogs that I manage, so if you find one with no recent posts, please try one of the others. They all deal exclusively with the flora and fauna of the Esperance region of Western Australia, so may also be of interest. Esperance is situated on the coast a little over 600 km ESE of Perth and 350 km south of Kalgoorlie. Temperatures are generally mild with a dominant winter rainfall of around 600 mm a year, although this drops rapidly away from the coast. The near coastal areas comprise alkaline sands formed into stable vegetated dunes often over limestone. Here the vegetation is less diverse than further inland and has many fast growing colonising species, some of which can become weedy and invasive elsewhere. Just behind the coastal dunes are deep acid sands with many ephemeral swamps. It is this coastal heath zone, where the greatest plant diversity is to be found. However both regions contain their own species that are not to be found in neighbouring habitats. Behind the coastal heath is the mallee (much converted to broad-acre wheat farming), here the soils are generally heavier, but mainly still well drained with a fine sand/clay content. These soils are usually acid to neutral, but generally overlie limestone, or to a lesser extent clay. Another important soil type is a gravel that is mixed with a fine sand/clay base that is often used for making rural roads; these gravels are usually covered to varying depths with a sandy soil and support considerable flora diversity. Saltlakes are common throughout the region, varying greatly in size. Some in the drier regions often have a very high gypsum content, resulting in dry, light grey, talc-like mounds, which support a more limited number of species, but which are commonly unique. Different species grow on islands within the lake or around the edges in soils, which tend to contain more sand or clay and less gypsum. 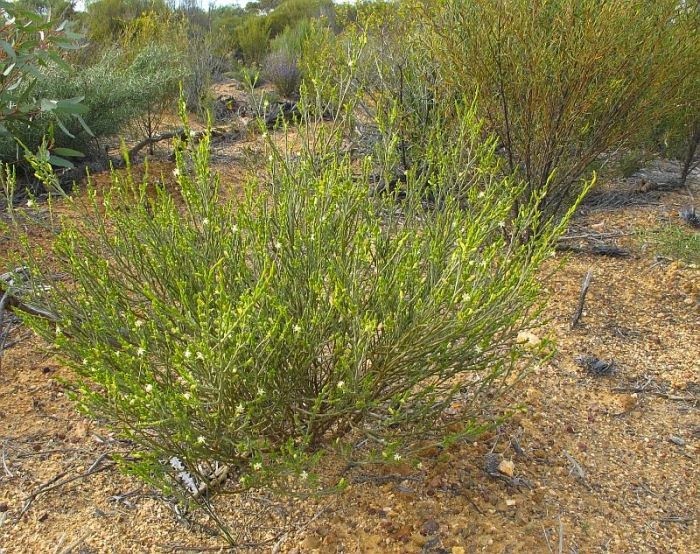 To complete the main habitats of this region are the numerous granite outcrops, these span from the coast to the mallee, and many contain flora found nowhere else. This is especially true in the drier regions as the granite collects and directs rainfall into well-watered zones to permit the survival of plants with a higher water/temperature requirement. Wildlife is largely dependent on rainfall and vegetation type, so Esperance being favoured with extensive habitat diversity is likewise rich in species. Threats to this environment are currently inappropriate land management, introduced weeds and predators like cats and foxes. All of which impact heavily on the flora and fauna. I have always been passionate about nature and for many years have lived in the bush and so been privileged to witness the private lives of indigenous wildlife and the floristic wonders of Western Australia's often unique flora. These blogs are a serious photographic record of the biota of the Esperance region and will contain species I have personally photographed, conscequently it will be updated as new species are filmed or better photographs taken. Should any errors be noticed, please point them out so they may be corrected. Hopefully, these blogs will be used to identify the flora and fauna of the SE coastal and hinterland region of Western Australia, or like me, just to wonder at the magic of its diversity.